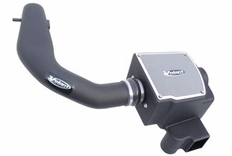 2004-2008 Ford F-150 5.4 V8 Volant Cold Air Intake5GarrettDecember 11, 2011Great price and free shipping from NewLevel. Very sturdy build kit, once I got the box in place it wasn't too hard. Now the scoop was a little tougher. I had box and everything in first, then put scoop on from underneath, not sure thats the right order. Anyways got it on and everything seems to be fine. TIRES WILL RUB SCOOP WHEN TIRES ARE TURNED VERY FAR RIGHT!! Not sure what volant was thinking about there but other than that it's great! 2004-2008 Ford F-150 5.4 V8 Volant Cold Air Intake5DreOctober 6, 2011Definitely makes an good increase in power. Around 4k RPMs is when you really can notice the difference. At about 2500 rpms is when that great drone comes in quite loudly as do normal CAIs. 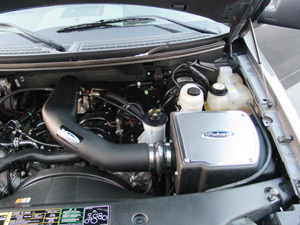 2004-2008 Ford F-150 5.4 V8 Volant Cold Air Intake5JoeyNovember 28, 2010Very satisfied with New level. I received my air intake 1 day before UPS tracking status said (less than a week overall) and I live in Alaska. Plus it was FREEEEE shipping up here! finally intalled it, took a little longer than I had hoped but not to bad, just a couple hrs due to some other Items I had to relocate under the hood to accomodate the volant filter box (aftermarket items that I put on previously) Great throttle response and hopefully safe on some fuel. 2004-2008 Ford F-150 5.4 V8 Volant Cold Air Intake5LindseyAugust 29, 2009My husband and I bought this for our friend. He loves it. The part number for this Volant Intake is 19754 or 197546, depending on your filter choice, and it fits 2004-2008 Ford F150 5.4 models.